At a time when Communism appears to be in terminal decline, it was amazing to see it’s founder Karl Marx alive and kicking on a British stage. Written by Richard Bean and Clive Coleman, this effervescent production on the Young Marx — full of satirical references — depicts a 32-year old Marx on the run from the law in London. Ducking in and out of his home on Dean Street, Soho, pursued by law enforcers and bailiffs — Marx is energetically pursuing his own consumption of liquor at the all the pubs down the road. There is nothing of the staid-faced, white bearded intellectual that was to emerge in later years. In fact — he sleeps with his wife’s maid, fathers an illegitimate child — runs around in careless havoc whilst being persuaded by the definitely more wealthy and infinitely more stable Friedrich Engels to write. This is London in the 1850s, still mired in misery, where children and women starve on the streets both here and in Manchester. 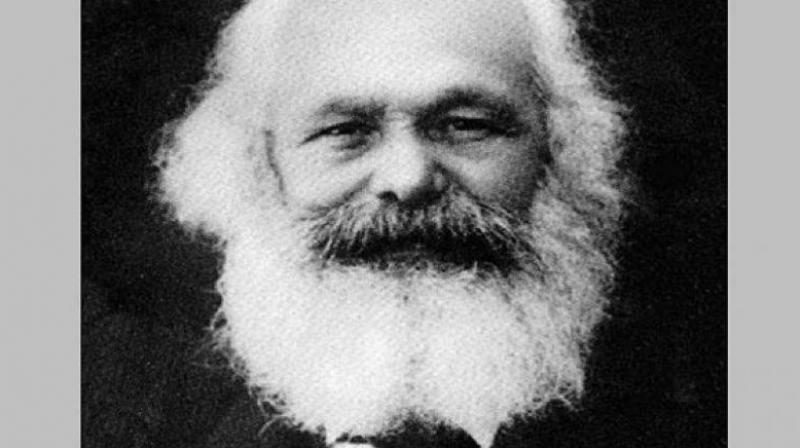 Marx himself is struggling — albeit with great abandon, but with a childlike dependency on those around him. The play is both an insight as well as a slice of history — about how he, as a penniless immigrant, even tries to pawn his long-suffering wife’s silver heirlooms — and is almost thrown into jail for that. It is the kind of play that is strong and refreshing, and in fact should be staged in India — just to demonstrate how feet of clay or foibles do not destroy reputations. In fact, it makes Marx ever more interesting — to see the wild “youth” he had, the near ceaseless and rather merry fashion in which he exploited those around him to reach his own goals. Indeed were it not for the steadfast belief that Engels had in him, or the support that his wife Jenny von Westphalen gave to him — one wonders if he could have survived in those parlous conditions. A wonderfully, well-woven play — a must-see for all those who have placed him at near God-like levels. It was a full house at the beautifully constructed Bridge Theatre — just near the Tower Bridge. Meanwhile, there is little doubt that for me and the team which has set up a museum in Amritsar on the events around Partition (before and after) the challenge has always been to gather material — because the very active officers of the East India Company and later the British government carried shiploads of very crucial material away. Much of that information lies abroad — and of course at the British Museum as well — where indeed centuries of Indian inheritance are scattered all over various galleries. At a visit this week to the British Museum, I once again gritted my teeth because apparently we must be grateful that the Brits “preserved” our culture — much of which would have been lost, otherwise as we (Indians) were so indifferent about preservation. Of course now times have changed — and we have a young generation (as I have found) in India anxious to preserve our own culture and tell our own stories, and so our Partition Museum at Amritsar is growing into a reflection of contemporary India. And I would now urge all to please send us any archival material, specially from the late 19th century onwards. In this context I was taken aback to see a new gallery coming up on “South Asia” at the British Museum — in which there is a section on “Independence and Partition”. And now to my utmost despair — I see contemporary material being donated to them as well. Though this section is a recent and rather haphazard addition (we could have given some very good advice on how to do it) — I now request everyone (both from India as well as the diaspora) — to please send any archival material they have to us at the Partition Museum, Town Hall, Amritsar, where it would add immense value rather than become a small section in a large and undoubtedly grand museum. Did that sound too impassioned? Well only because at a recent talk I gave last week at the London School of Economics (organised by the London-based Migration Museum Project) on “What we have learnt 70 years after the Partition of India” — it was wonderful to see a packed hall — with a really engaged audience. Again there were suggestions that the Partition Museum should be in London — as it would be easier for members of all communities to visit. But fortunately, there were also equally strong voices who agreed that it is about time we have local museums and the Partition Museum could become the definitive space for the building of community memories and preservation of culture. It was really very heartening to see the number of people who immediately pledged to go to Amritsar and visit the museum there. It is this spirit that convinces me that while it might be too late for reparation — and we might never get the Kohinoor back — it is time for each of us to pledge that any more historical and archival material does not flow out of India. And somewhere the reverse process must begin. Wouldn’t you agree?